EXPOSED: DUBLIN’S SUPPORT OF TERROR FEST!!!!!! | AMERICAPHILE RESURGENT!!! ← ILEANA ROS-LEHTINEN STANDS UP TO TERROR!!!!!! EXPOSED: DUBLIN’S SUPPORT OF TERROR FEST!!!!!! WHY IS THE DUBLIN REGIME’S TAOISEACH [BWAHHHHHH!!!!!] WELCOMED TO THE WHITE HOUSE IN SPITE OF HIS TOURIST BOARD’S OFFICIAL WEBSITE’S PROMOTION OF A TERROR FESTIVAL?!?!?!!? “‘Che do Bheatha’ Latin-American Cultural Festival celebrates not only Che Guevara’s visit to Kilkee in 1961 but also all things cultural from Latin-America including music, poetry, dance, film, food and a shared history not forgetting the fact that Che Guevara’s great grandfather was Irish (Lynch)! The iconic poster and tee-shirt image of Che Guevara was born as a result of a chance meeting between the artist Jim Fitzpatrick and Che Guevara in Kilkee’s Marine Hotel in 1961. Che Guevara and his entourage of 35 were on their way from Prague to Havana and were fog-bound en-route through Shannon Airport. They ended up staying in Kilkee overnight on 12 September, 1961 in the Strand Hotel in the town. 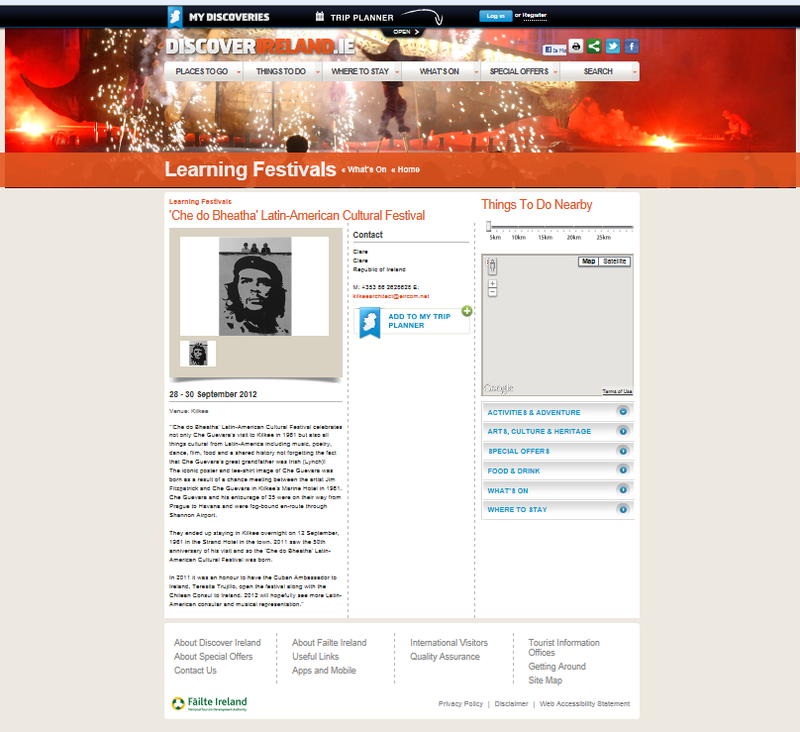 2011 saw the 50th anniversary of his visit and so the ‘Che do Bheatha’ Latin-American Cultural Festival was born. ”every word spoken in Irish is another bullet in the freedom struggle” came from Sinn Fein’s Danny Morrison. THIS MINISTRY IS GRATEFUL TO CONGESSWOMAN ILEANA ROS-LEHTINEN FOR HER STEADFAST COURAGE REGARDING THIS VITAL ISSUE!!!!! GIVEN THIS, ALONG WITH THE ENORMOUS LEVEL OF VIOLENCE IN THAT DARK LAND, WE CAN SEE THAT EIRE IS A HOSTILE PLACE FOR FREEDOM-LOVING AMERICANS!!!!! NOTICE ALSO THE USE OF THE LEPRECHAUN LANGUAGE IN THIS TERROR FESTIVAL’S NAME!!!!! Four words………OLIVER CROMWELL………..SPECIAL RELATIONSHIP…………go figure! PARTNERS IN FREEDOM AGAINST NAZI TERROR!!!!! AMERICA NEEDS TO HONOR THE MEMORY OF OVILER CROMWELL!!! AMERICA ♥ MRS T, BRITAIN’S SECOND GREATEST LEADER!!!!! Pingback: PLOT TO DESTROY AMERICA’S GREATEST ALLY!!!! « AMERICAPHILE RESURGENT!!! Pingback: HANDSHAKE?!?!? NOW, BACK IT UP!!!!!! « AMERICAPHILE RESURGENT!!! Pingback: CLAUDY BOMBING: THE TEST CASE FOR REPARATIONS!!!! | AMERICAPHILE RESURGENT!! !